Since I released my newest product, "Immunity of Thieves Essential Oil Blend", there has been a flurry of miraculous results. My family and I have used essential oils for years, with wonderful results. In fact, I attribute our lack for the need of antibiotics for over 14 years to our use of essential oils and other holistic methods. Over the past three weeks, this incredible oil has been used by people who normally use conventional means of treatment (antibiotics, and over-the-counter medicine) during a bout of flu or respiratory infection. These people have used my new product with stunning results! I LOVE your Immunity of Thieves! As you know, I am a skeptic and so the thought of rubbing some oil on my feet for a healthier life... seemed futile. About over a month ago, 3 of my kids were so sick, (coughing, runny noses, fevers, sore throats, etc.) I was certain that they would all need antibiotics. My father-in-law is a doctor and so getting a visit or a prescription is super easy. Last winter it seemed like one of us were always on some medication. So when my kids were sick and you suggested I give Immunity of Thieves a try, I thought to myself "what the heck, it won't hurt." I faithfully rubbed them with the oil every day (sometimes throughout the day for coughing), and I am so happy to tell you that we are all so healthy and I am a happy mom!!! NONE of us needed a doctor visit. I use it every day and I love the smell. I can't thank you enough for introducing me to this product. It has been life-changing. 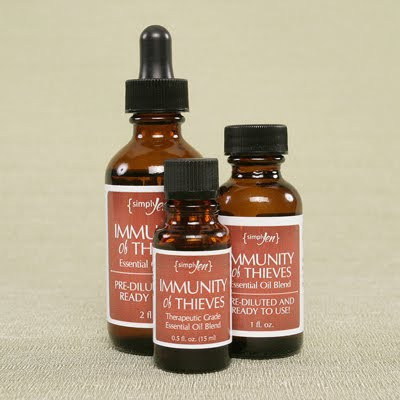 I am becoming a firm believer of Simply Jen's Immunity of Thieves oil. My 7-year-old has been getting croup ever since he was an infant and when he has it... he is sick! He gets a fever and is very wheezy. Well, my mother-in-law happened to have some Immunity of Thieves on hand when she heard my son had come down with croup (the croup came in the middle of the night). She hurried over in the morning with some oil for me to try on him. I wanted to try anything, knowing a fun holiday was coming up that he did not want to miss. I was amazed! He looked and felt better in hours. I rubbed the soles of his feet, and his neck and chest 3 times that day and repeated the doses the next day. He never even coughed the night of the first three applications (which is usually a really bad night for him), he woke in the morning a little congested, we repeated the doses....croup never returned and a fever never came. WOW! Thanks Simply Jen!!! So, what is Immunity of Thieves Oil? It is an essential oil blend of Clove, Lemon, Cinnamon Bark, Eucalyptus, and Rosemary. The full strength blend must be diluted before applying to the skin. I recommend diluting 25 drops of Immunity of Thieves with 1 tsp carrier oil (like Olive Oil) and applying to the bottoms of the feet as a daily ritual to keep from getting sick. For those who are already sick, I recommend diluting the full strength blend even more (especially for those with sensitive skin) before applying to the chest, and down the spine. 10 drops to 1 tsp of carrier oil is a good dilution for this application. When using on young children and babies, dilute 1-2 drops of Immunity of Thieves Oil with 1 tsp. carrier oil. You can experiment with the dilution ratios after you become familiar with what strengths your family's skin can handle. The cinnamon makes it a hot oil, so care should be taken. If in doubt - the bottoms of the feet are always the safest place to apply it. I'm so excited about this blend an am grateful to be able to offer it to my friends and family (strangers too!) at a fraction of the cost of other similar blends out there. Another company sells their 1/2 ounce blend of these oils for nearly $42! I am offering mine for less than half that amount! In my opinion, this is a great alternative to doctor visits, copays, antibiotics, or other expensive prescriptions, and provides fast relief from the discomforts of being sick!